All day long on Friday, the entire spectrum of German media paid tributes to Hans-Dietrich Genscher. They were joined in the evening by the Chancellor, who ‘bowed in deep respect for the lifetime’s work’ of the former foreign minister. 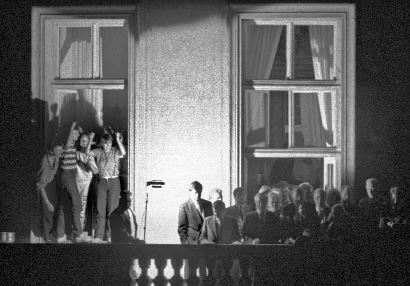 30 September 1989, Prague, German Embassy. All of them referred to the key scene of 30 September 1989, when Genscher appeared on the balcony of the German Embassy in Prague and announced to 4000 East German citizens that had sought refuge in a hopelessly overcrowded house and garden – very literally ‘huddled masses yearning to breathe free’ – that he had managed to realise their transfer into the Federal Republic. The most famous unfinished sentence of German history, which so many years later is still a deeply moving memory. How many of these 4000 desperate individuals take part today in Pegida demonstrations against migrants and asylum seekers from elsewhere, waiting jam-packed like they were themselves for an open door to a better life? Just wondering. After Egon Bahr and Helmut Schmidt, Hans-Dietrich Genscher is yet another of those major Cold War politicians who disappears; another of those tireless networkers and negotiators whose actions have had a long-term impact on what happened on both sides of the Iron Curtain and shaped the Europe we are now living in. No need here to reformulate the respectful tributes and obituaries that can be found in quite a few different languages on the web today. Let me just take the liberty to talk a short stroll down memory lane. To me, Genscher’s death recalls just how much of democracy’s stability depends on the human resources that are available at a given moment for political leadership. In 1972, when ‘international relations’ entered with a loud crash the political consciousness of a ten-year old enthusiastic about the Munich Olympics, Genscher was already there, offering himself, in vain, as substitute hostage to the Palestinian terrorists. Ten years later, when I was doing my military service bravely protecting the Iron Curtain, Genscher was negotiating and implementing the NATO double-track decision. And another ten years later, my generation was actually surprised to see him retire after having led, together with Kohl and Schäuble, Germany to reunification in peace with its neighbours. A German government without Genscher? Unthinkable. 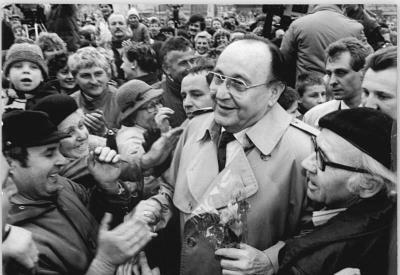 Hans-Dietrich Genscher, East Germany, February 1990. There is of course a whole range of factors that may explain why the Bundesrepublik, which Genscher served for over two decades, turned from a fragile young republic to a anchor of democracy and freedom respected across the world, and contemporary history and political science will be happy to provide convincing explanations. I can’t help but wonder, though, whether one of these factors was not ‘sheer luck’. Perhaps, after all, the Germans have simply been very, very lucky with their human resources management at the top of the state. Lucky that those individuals who made it to key positions were really up to the job. And even luckier that those who might well not have been up to it and jeopardised the development of the Republic – think of Strauss, Stoiber, Lafontaine and the like – failed on the doorstep of power. Luck is not a concept of any serious political theory I know of, but the simple observation of the current development of democracy suggests that countries which can count on human resources like Hans-Dietrich Genscher may well be entitled to call themselves lucky. This entry was posted in Current Affairs, Democracy & Citizenship and tagged democracy, Germany. Bookmark the permalink. Previous: Tinker, Tailor, Soldier, … Brexit!